It’s finally here!! Cherry Season has finally reached Texas 🙂 While cherries don’t actually grow here in Texas every year around the first days of summer they start to crop up in the produce sections. I usually end up coming home with two bags of cherries from the store, one bag of the sweet red and yellow Rainer cherries and one bag of Bing cherries. Honestly how’s a girl suppose to choose between the two? I love them both and I always keep them around this time of year for snacking on and every year I make a Two Cherry Sweet Cherry Pie. 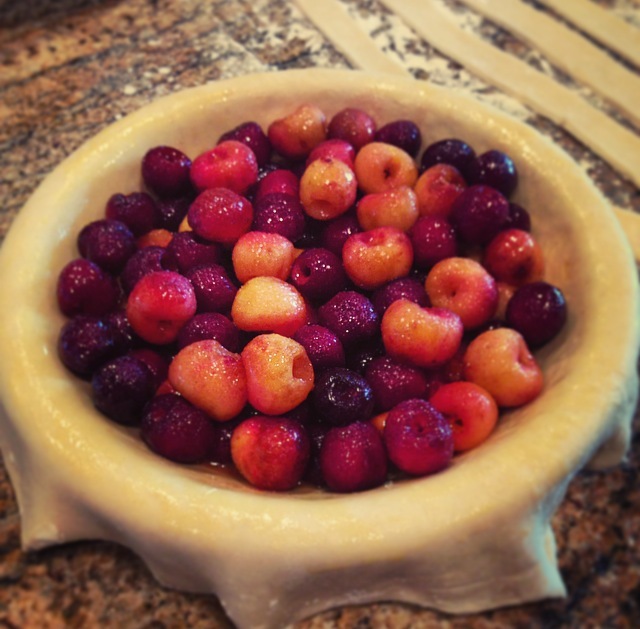 Is it traditional to use two types of cherries in a pie? 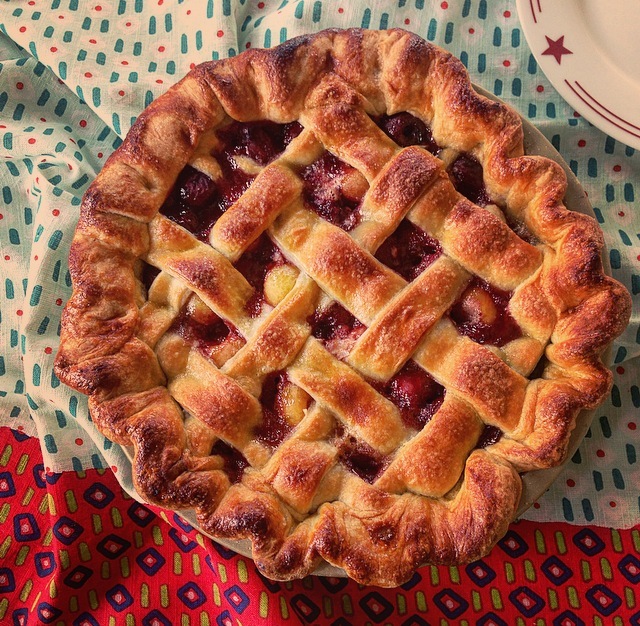 Maybe not but I love the color with the yellow and red cherries peeking through the top of the lattice pie crust. This past Thanksgiving a good friend of mine, Kelly, brought her amazing Cherry Pie to “Friendsgiving” for dessert. Her cherry pie was so delicious and I asked her how she did it, what was her secret ingredient. She said “Cinnamon, Lemon, and Apple Pie Spice.” I made a mental note for next time I made a cherry pie. 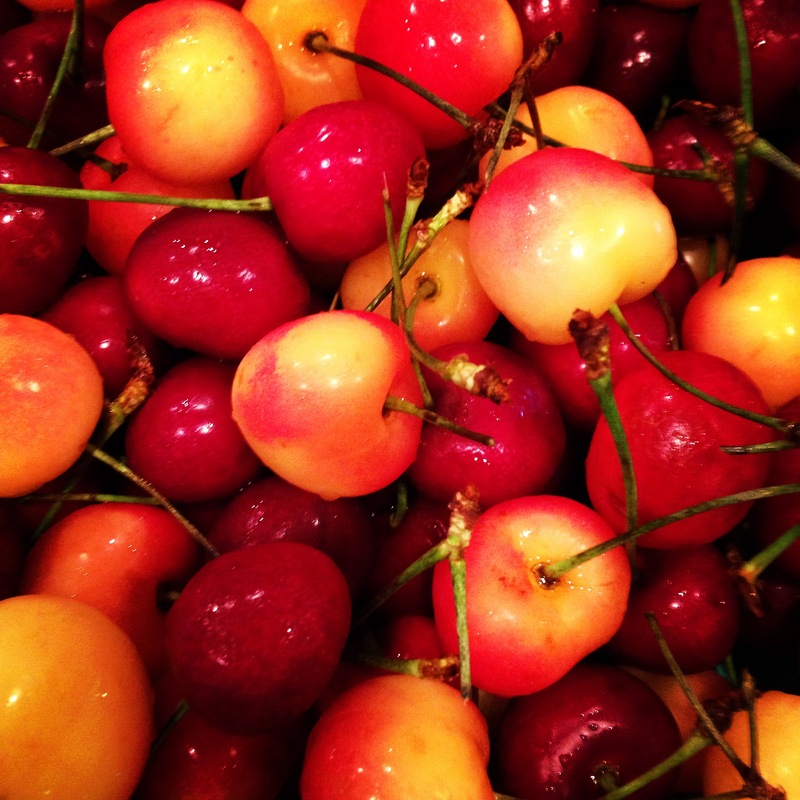 Flash forward to Father’s Day weekend and back to cherry season…. I asked my Dad what dessert he would like me to make him for Fathers Day. Peach Cobbler or Cherry Pie? He didn’t hesitate and said Cherry Pie. So thanks to Kelly and a few of her secret cherry pie ingredients (I added the lemon zest and cinnamon, sadly I didn’t have any apple pie spice) here is the updated Two Cherry, Sweet Cherry Pie recipe. 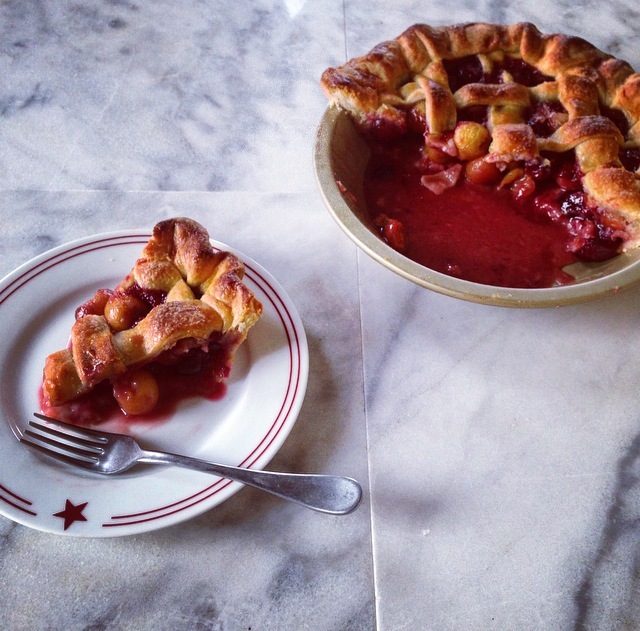 I’ve simplified a few things from the previous Sweet Cherry pie recipe and honestly I think this one is here to stay. Let’s call it Sweet Cherry Pie 2.0H So Good! What are some of the best cooking secrets you’ve received from a friend? 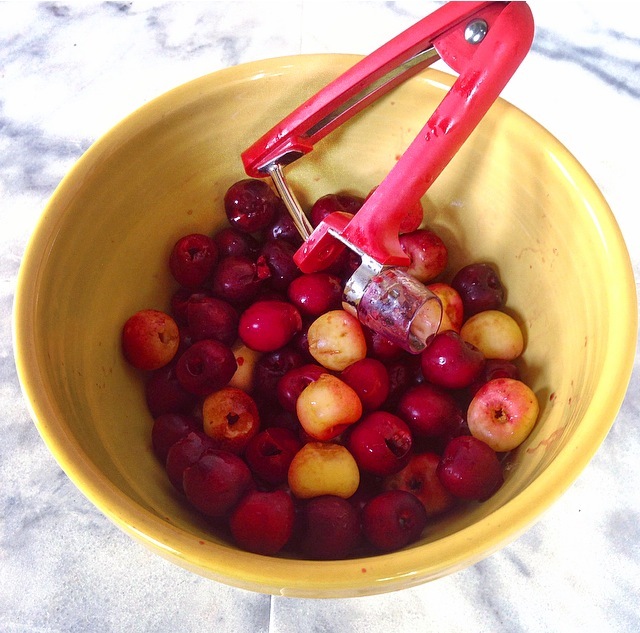 Preheat the oven to 400 degrees Using a Cherry Pitter remove the pits from 5 cups of cherries…. I usually measure out a little more than 5 cups because I know I will not be able to resist eating some of the cherries as I go. 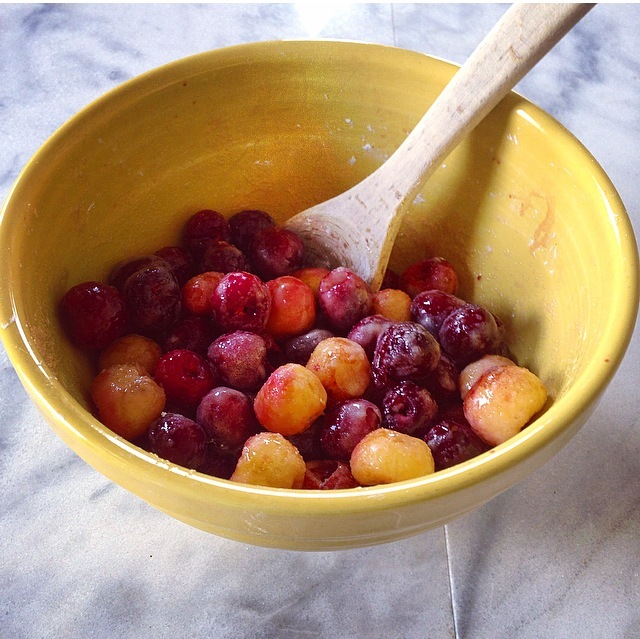 In a large mixing bowl add the pitted cherries, 1/2 cup sugar, salt, cinnamon, cornstarch, almond extract, vanilla extract, lemon zest, and amaretto. Stir to combine and set to the side. Roll out the bottom crust and fit it into a metal pie pan then place in the freezer while rolling out the top crust. Roll out the top crust and with a sharp knife cut it into 8 somewhat equal strips, they don’t have to be perfect. 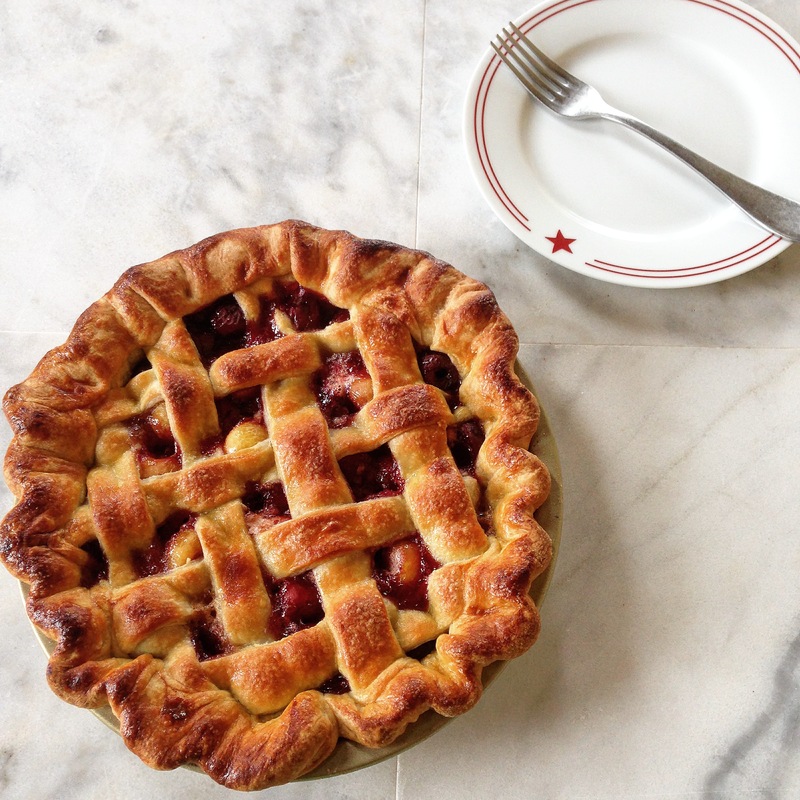 Remove the bottom pie crust from the freezer and brush the entire inside of the pie crust with the egg wash (this step gives you that crispy bottom crust) then add the cherry pie filling. For the lattice top…Sorry I didn’t get picture of this stage as it took all my concentration. Step 1: Lay 4 of the cut strips of pie crust across the filled pie going north to south somewhat equally spaced. Step 2: Fold the 1st and 3rd strips back half way and lay one strip across the middle of the pie going west to east. Then lay strips 1 and 3 back. Step 3: Fold strips 2 and 4 back until they intersect the 1 strip going west to east. Now lay another strip going across the pie going west to east. Step 4: Turn the pie 180 degrees so the finished lattice half is closest to you, then repeat Steps 2 and 3. Trim off the excess dough from the strips, fold the bottom crust over and seal the edges. Brush with the egg wash and sprinkle with 1 tablespoon of sugar. Dot the top of the pie with 1-1/2 Tablespoons butter cut into small pieces. Place pie on a sheet pan and bake at 400 degrees for 35-40 minutes, until bubbly and golden brown. Allow the pie to set up and cool for 1 hour then slice and serve to your hearts desire! Dice the butter and return it to the refrigerator while you prepare the flour mixture. Place the flour, salt, and sugar in the bowl of a food processor fitted with a steel blade and pulse a few times to mix. Add the butter and shortening. Pulse 8 to 12 times, until the butter is the size of peas. With the machine running, pour the ice water down the feed tube and pulse the machine until the dough begins to form a ball. Dump out on a floured board and roll into a ball. Wrap in plastic wrap and refrigerate for 30 minutes. Cut the dough in half. Roll each piece on a well-floured board into a circle, rolling from the center to the edge, turning and flouring the dough to make sure it doesn’t stick to the board. Fold the dough in half, place in a pie pan, and unfold to fit the pan. Repeat with the top crust. What a gorgeous pie! Love the amaretto in it-will definitely make cherry pie this week!!! One of my favorite tips from a friend is to always garnish a plate with fresh parsley or cilantro. 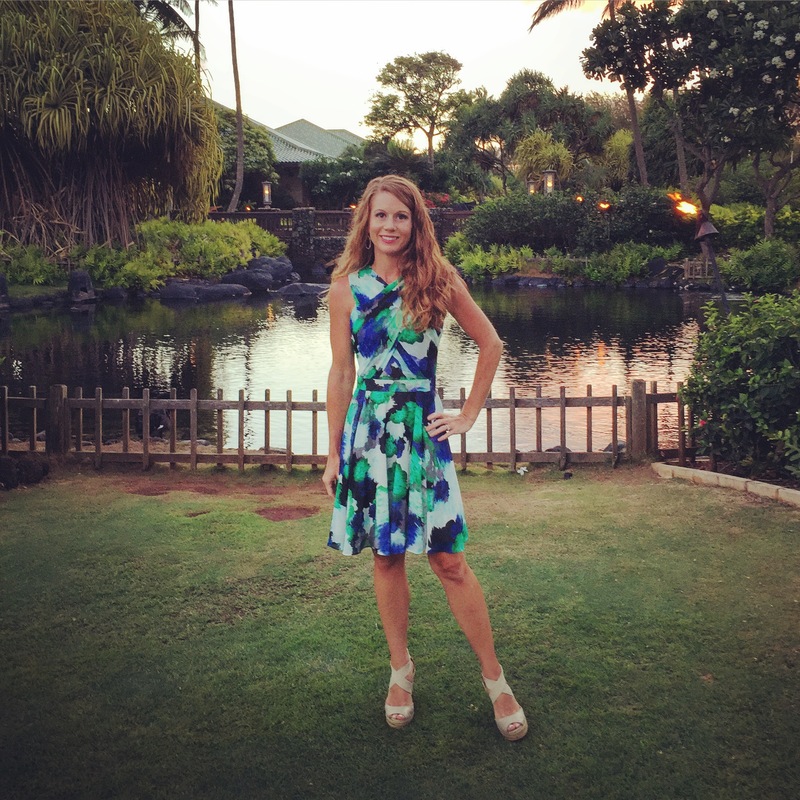 The pop of color and freshness is a compliment to almost every dish. A squeeze of lemon juice the perfect acid to brighten most sauces and dressings, too. These may seem obvious, but easy to forget when you’re in a hurry-those extra few seconds will pay off for sure. Gorgeous looking pie, great job! Cherries, almonds and vanilla is a winning combination. 😀 Thanks Stefan!! I can’t eat enough cherries this time of year. If only I could have my own cherry tree. Wow! this pie is a work of art! Looks like a classic. Wonder if I can manage to make one for the 4th of July. so pretty Mel. This looks absolutely delish! Luckily I live in Bing and Rainier Cherry part of the world. I had a Bing cherry tree at our rental house we had for three years! I let the birds eat most of them as the tree was so old I couldn’t reach any of the cherries without a ladder. Thanks Dawn 😀! 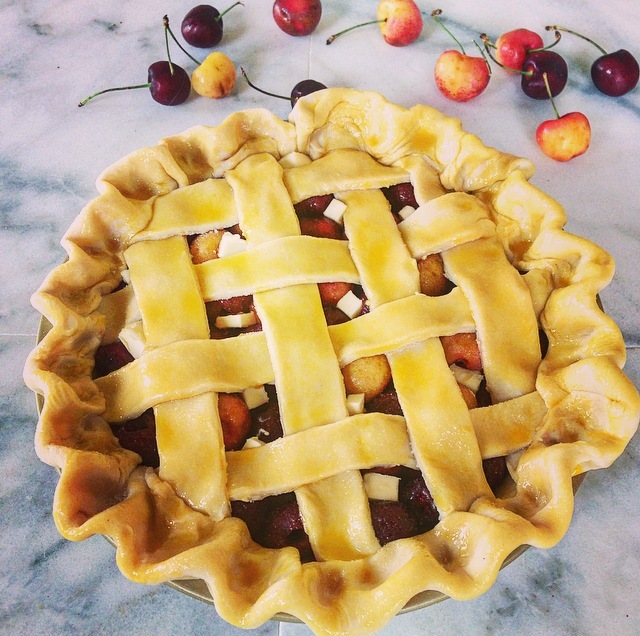 Cherry season is the best hope you enjoy making pie.